Between 2005 and 2010, I was privileged to publish, through Echelon Press, five mystery novels featuring Steve “Snap” Malek, a police reporter for the Chicago Tribune, which happens to be an old employer of mine. These books, set in Chicago between 1938 and 1949, chronicle Malek’s adventures while investigating murders, and in the process, he runs into both fictional characters and famous people of the era. These legends include Al Capone, actress Helen Hayes, baseball star Dizzy Dean, architect Frank Lloyd Wright, nuclear physicist Enrico Fermi, President Harry Truman, ill-starred carmaker Preston Tucker, and Walt Disney. I was a police reporter only for a brief spell at the beginning of a journalism career that spanned 44 years, but it was long enough to create a permanent impression of the experience that enabled me to develop police reporter-protagonist Steve “Snap” Malek. My five Malek mysteries from Echelon Press are set in Chicago between 1938 and 1949 and are set against the backdrop of real events, among them the Chicago Cubs’ classic 1938 pennant race, the early work on the atomic bomb at the University of Chicago in 1942, the tragic Naperville, IL. train wreck of 1946, and the historic 1948 presidential campaign between Harry Truman and Thomas E. Dewey. Now my brief time as a police reporter took place in 1959, well after the time frame of the Malek stories, but the Chicago of the late ’50s was little changed from the two preceding decades. In my books, I felt comfortable describing the sprawling city, the newspaper business, and the police department that existed in a slightly earlier time. My fictional “Snap” Malek (so nicknamed because he always wears a snap-brim hat) interacts with many historical figures, including Al Capone, actress Helen Hayes, baseball pitcher Dizzy Dean, star-crossed automaker Preston Tucker, newspaper magnate Col. Robert R. McCormick, President Truman, future Chicago Mayor Richard J. Daley, and filmmaker/cartoonist Walt Disney. Malek, who possesses what other describe as “essential brashness,” is not intimidated by coming in contact with these and other well-known figures, which is one of the hallmarks of newspaper reporters. To them, famous persons are useful because the help make the story headline-worthy. I am very fortunate to be a mystery writer in the Chicago area because of the strong support and encouragement I receive from other authors in the region. And I am hardly alone. Mystery and crime writers working in Greater Chicago, almost without exception, applaud the successes of others in the field. We attend one another’s book signings and other events, e-mail or text congratulations on awards and good reviews, and generally serve as an informal “cheering section” for colleagues. There seems to be an almost total lack of jealousy or resentment of success. Now, it is possible this spirit of collegiality also exists in other metropolitan areas, although I am not qualified to say, having lived my entire life in what our media like to term Chicagoland. I only hope other cities have this same spirit. Whether or not these cities are similar, I am proud to be a part of the Chicago area’s mystery writing community and its generosity of spirit. 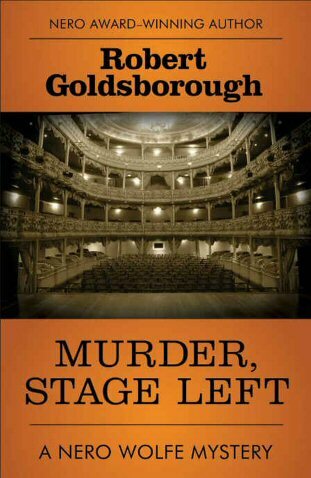 The arrival this month of “Murder, Stage Left” marks the publication of my 17th mystery novel. Below, in the order they were written in each series, are the titles. I was delighted to learn that my latest Nero Wolfe novel, “Murder, Stage Left,” has been warmly received by the publishing industry. Long before I was given the wonderful opportunity to write and publish the Nero Wolfe stories, I had always viewed Rex Stout’s creations as “the ultimate New York mystery series.” Mr. Stout placed his tales in the midst of the largest city in America, with numerous references to businesses, landmarks, and neighborhoods. With New York, and specifically Manhattan, in mind, I have endeavored to work into my stories the businesses, entertainments, and industries the city is famous for. “Murder, Stage Left” is a case in point, using the Broadway Theater as its backdrop. What other city has a theater scene to compare with that of the Big Apple? Other New York strengths I have focused on in my books include: the advertising business (“Fade to Black”); book publishing (“The Missing Chapter”); newspapers (“Death on Deadline”); major league baseball (“Murder in the Ball Park”); and a symphony orchestra (“Murder in E Minor”).